Suwałki guide. What to see, what to eat & where to sleep? Some people think, that Suwałki are very far away from our city, and that the journey to this area is like expedition by Trans Siberian train! But… sometimes it’s worth trying – just get out of your comfort zone, get in the car & go. Discover beautiful landscapes, great places & delicious food. In this article you’ll find few hints for you. Travel in MYTUJEMY style! Suwalszczyzna, that means… Wigierski Park Narodowy & Wigry Lake! These are the must-visit places in this area. Lakes, forests, meadows, viewpoints in the center of the green hills – these are just a few things that must be seen during your visit. Good news also for bike fans – the bike paths here are amazing, you will not get bored! We were on Suwałki twice – first we forgot to try kartacze! So next visit was all about eating this food. Oval-shaped dumplings are the best! A regional dish made from potato pulp, stuffed with minced meat, seasoned with garlic. Kartacze are served with fried bacon or vitrified onion. Apart from Suwalszczyzna, you will also eat it in Masuria, Podlasie and even in summer resorts. As the chief potato eaters (well, we are from Poznan!) we have to admit that KARTACZE are everything! A cake that resembles a deceptive mound. It consists of irregularly fried faworki with liquid honey, poppy seeds and raisins. Legend says, that this dish was served only on tables in rich houses & families. The hotel restaurant, where we spent a lot of time. 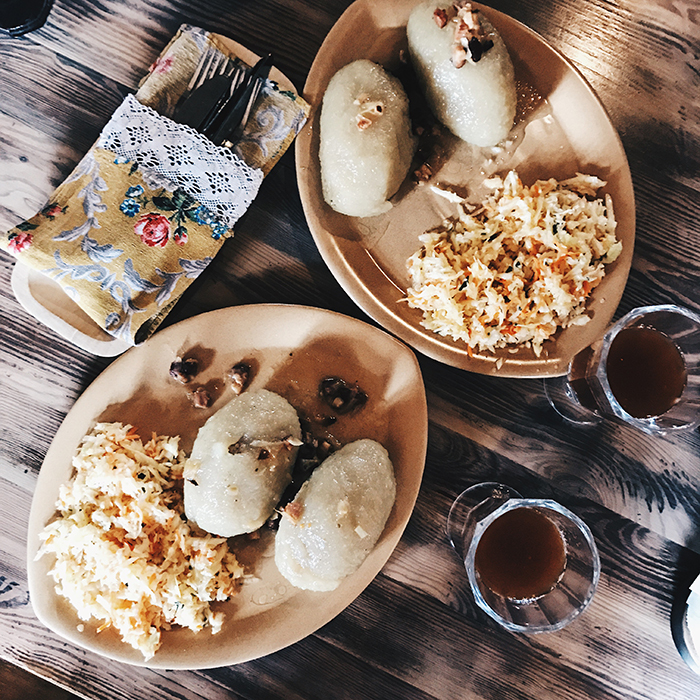 In addition to the standard offer of a Swedish table during breakfast, you can eat dishes from a regular menu car and the doors are also open to the residents of Suwałki, obviously. In the offer – steaks with high-quality beef, salads, finesse appetizers, children’s dishes and great alcohol card. During our majestic stay we hit the seasonal asparagus as the main menu. From German cuisine towards the Suwalki region! Baked on an open fire on a spinning sponge the biscuit-fat cake is another food hint from this beautiful area. It reminds us of a decorated Christmas tree. The taste itself didn’t impress us, but we had to try this. Do you know that sękacz is also popular in… Japan? Every year, hundreds of locals are looking forward to the season for this masurian fish – stynka. We tried this taste in the Dworek Hołny. It was served with fries and a set of salads, (not so traditional), but the taste totally surprised us. What is important – because of its small size – on the plate it really was quite a lot, so we were sure that we are no more hungry! Besides dishes called “regional” in the menu you will also find the classics – schabowy, tomato soup or dumplings. For our stay we chose Velvet Hotel in the heart of Suwalki, at the intersection of Kościuszko and Dwernickiego streets. What is important, there is air conditioning, free wireless internet, allergy-free bedding in every room! Guests of the hotel also have a SPA (Finnish steam bath, steam sauna, jacuzzi, exercise room and relaxation room). Price per night – 359 PLN – if you choose to book through booking.com. Being in the Suwalki region you can go visit Vilnius in 3 hours by car. It is worth venturing for such an expedition. Even for a taste of local food and to see the strategic locations of this beautiful city. Vilnius in our minds was really ugly & poor and here… a huge surprise. The city is fully urbanized, we got public transport, restaurants, shopping galleries, museums! In Vilnius we have discovered an interesting place – Snekutis (Sv. Stepono 8, Vilnius, Lithuania). You can eat here a delicious chłodnik, fantastic cepeliny (kartacze), you can also try porcine ears and drink a beer. Extremely atmospheric place – darkened interior with soul and service in the form of a host with a beard like Gandalf. Do you like what you’ve read? Let’s share it. It means a lot to us. Find out more on our Instagram, Facebook and our Snapchat: MYTUJEMY. Our official hashtag – #MYTUJEMY – tag yourself and let us find you! WHERE TO EAT SHAKSHOUKA IN POZNAŃ?